Every plant must have a healthy root system. Pathogens can attack and damage the roots of one plant, then rapidly infect other plants in the garden. Fusarium, Verticillium and Pythium are common and destructive root aggressors known to all growers, whether soil gardeners or hydroponicists. Fusarium inhabits the soil. Fusarium fungi vary across many species and subspecies, and a given strain of the fungus targets only a few plant species. Several strains target cannabis. Fusarium is so devastating that the US government has developed special strains to target cannabis and coca as part of the “War on Drugs.” The coca strain has been released on coca plants in Colombia. Different Fusarium species produce somewhat different diseases in cannabis. These diseases, primarily Fusarium wilt and Fusarium root rot, present different symptoms but respond to similar prevention and control methods. It is not commonly found in marijuana gardens. However residual spores are more common in soil where hemp was once grown or where it still grows as a weed. Growers using hydroponic systems or sterile or pasteurized planting mix seldom see it. Fusarium infections are most common in warm weather, but overall the frequency varies. Because it is soil-based and species-specific it may be extremely common in one area but rare in another where the soil is not infected. Fusarium spores can remain dormant in soil for years, and infected soil is nearly impossible to disinfect. The fungus can also spread from seed taken from infected plants. Damage from Fusarium wilt is most evident on the leaves and stems. 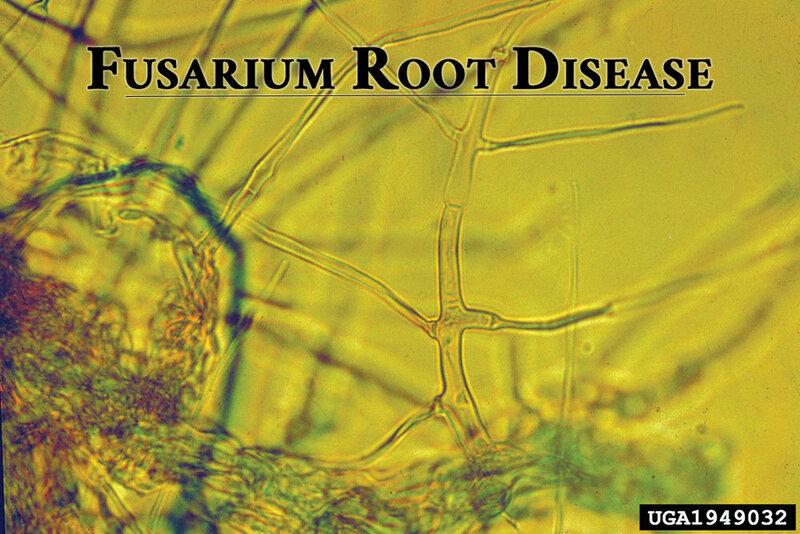 Fusarium root rot affects the roots first, then the disease works its way up the stem. Fusarium wilt initially appears as small, dark irregular spots on lower leaves, which quickly become chlorotic (yellow-brown). Leaf tips curl upward, and wilted leaves dry and hang on plants without falling off. Stems turn yellow, then brown, and finally collapse. In Fusarium wilt the roots show no outward symptoms if the diseased plant is pulled up. Fusarium infected cannabis crop in India. Fusarium root rot begins below the soil line, turning the roots rotten and necrotic and giving them a characteristic red color. The first visible symptom usually appears as the rot works its way up the stem, producing a red-brown discoloration at the soil line. This discoloration may progress to swelling and the stem may split open. The plant soon begins to wilt, then collapses as the decay spreads up the stalk. In both wilt and root rot the fungus spreads through plant cells and clogs the xylem vessels, inhibiting water and nutrient transport. This vascular clogging inside the plants causes the external symptoms of wilt and collapse. Infected plants usually die. Fusarium survives in the plant debris, so infected plant debris should not be buried, composted, or placed on uninfected soil. 1. If an outdoor Cannabis crop falls prey to Fusarium, that patch of ground can no longer be used to grow Cannabis at all, although other plants will do fine there. Likewise seeds produced by infected plants should not be used. The pathogen stays dormant on the seed and attacks the plant when the seedling emerges, causing damping off and likely killing it. 2. Avoid planting marijuana in the same ground for many years in a row. Even though none of the plants show symptoms, multiple successive plantings can cause the fungus to build up in the soil until it reaches destructive levels. 3. Certain soil types have been found to be less conducive to the growth of Fusarium than others. Clay soils have fungistatic properties due to their high pH. Loamy soils with healthy and diverse plant growth often harbor native microbes that suppress Fusarium. These soils do not stop the fungus, but they slow it down, and may be helpful in combination with other preventive measures. 4. Properly aged compost, and tea made from compost, help protect plants from all sorts of fungal infections. 5. Container gardening is one of the best ways to avoid Fusarium, because it gives the gardener complete control over the soil. If an area that would otherwise be ideal (weather, sun, etc.) is known to be infected with Fusarium then containers allow you to take advantage of the site’s strong points while avoiding the disease issues. In order to prevent Fusarium infections, use sterilized or pasteurized soil mixes and sterilized or new pots. Do not over-fertilize. Make sure the soil drains. 6. Mycorrhizae (beneÿcial fungi) help improve plants’ disease resistance. 7. Streptomyces griseoviridis, Bacillus pumilus, and Bacillus subtilis (all beneficial bacteria) or Gliocladium (beneÿcial fungus) can be applied as pretreatments for seeds, as a soil drench, or as a foliar spray. 8. Make sure the soil pH doesn’t get too low. Neutralize acidic soil with dolomite lime or greensand. Fertilizers enhanced with potassium and calcium can help fight off and prevent Fusarium, while excess nitrogen and phosphorous may make the disease worse. The only truly effective control is the removal and destruction of infected plants. After removing any affected plants use hydrogen peroxide (H2O2) to clean all the tools that touched those plants before using them again. Are you looking for an ENVIRONMENTALLY-SAFE ORGANIC solution to your bug problem?